Venezuelan President Hugo Chávez admitted last week that his government is “carrying out the first studies” of a nuclear program. He attempted to portray it as an innocuous program designed solely for peaceful purposes. 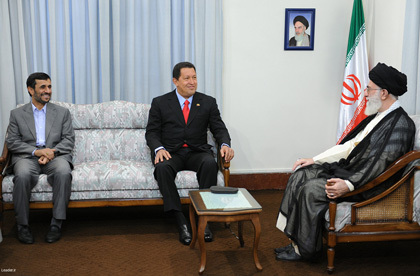 Chávez has been developing the program for two years with the collaboration of Iran, a nuclear rogue state. In addition to showing the two states’ cooperation on nuclear research, these documents suggest that Venezuela is helping Iran obtain uranium and evade international sanctions, all steps that are apparent violations of the U.N. Security Council resolutions meant to forestall Iran’s illegal nuclear weapons program. Chávez’s decision to rely on one of the world’s worst proliferators to help develop his country’s capabilities in this sensitive technology sets alarm bells ringing. Hezbollah supporters in South America are engaged in the trafficking of narcotics. Based on information developed by an intelligent office, the Iranians with the help of Venezuela are now engaged in similar economic and proliferation sanctions-busting schemes. For example, a November 2008 contract between a Venezuelan state-run firm, CVG Minerven, and the Iranian government firm Impasco grants the Iranians a “gold mine” concession in the heart of the Roraima basin in the southeastern state of Bolivar, which sits along the Venezuela-Guyana border. Although gold mining in Venezuela goes back decades, the basin is also home to one of the world’s largest deposits of uranium, according to a survey by the U308 Corp., a Canadian uranium exploration company. Ignoring what Chávez and his friends are up to right under our noses is no longer an option. If the United States and the United Nations are serious about nonproliferation, they must challenge Venezuela and Iran seriously. During the Iranian Industries and Mines Minister Ali-Akbar Mehrabian’s visit to Caracas, the two countries established some technical workgroups to accelerate their joint projects. Heading an industrial and economic delegation the Iranian minister left Tehran for Caracas on Wednesday. During his visit, Mehrabian has held meetings with the Venezuelan Vice President Ramiro Valdés Menendez and the nation’s Minister of Science and Technology. Mehrabian also opened Iran’s industrial capacities show in Venezuela on Thursday. As we know Iran’s regime offered to help Venezuela for its uranium mining also. Over 30 Iranian companies active in different fields such as oil and refinery, carpet and handicrafts, dried nuts and foods, tractor and automobile manufacturing, and home appliances are showcasing their latest achievements in the 4-day event. Iran has carried out several projects in Venezuela including car and tractor manufacturing units, 13 dairy factories, and cement production units. In January, the Iranian Ministry of Industries and Mines announced that 70 projects, mostly run by private sector companies, were being implemented in Venezuela. The projects are mostly in the areas of automobile and tractor manufacturing and the construction of cement and dairy factories. Hezbollah also has ties with Venezuela and has demonstrated a keen interest in extending its activities to other parts of Latin America. As of the early 1990s, Hezbollah had established a presence in the tri-border area between Brazil, Argentina and Paraguay. This lawless zone enables the Khomeinist network to develop illegal financial activities and train and plan for terrorist attacks in the region. The 1992 bombing of the Israeli embassy in Buenos Aires and the 1994 bombing of a Jewish center there are prime examples of Tehran’s terrorist activities and global reach. Rep. Sue Myrick, a Republican from North Carolina, is worried that Iranian agents are slipping across the U.S.-Mexico border after receiving training in Venezuela. Myrick, the ranking member of the House Subcommittee on Intelligence Community Management, says Farsi tattoos are popping up in prisons in the United States, and she sees this as proof of Iranian influence. Last month she asked the Department of Homeland Security to investigate. But the intelligence community doesn’t buy what critics call a confusing conspiracy theory. “We know Iran is trying to increase its presence in Venezuela and has regular flights there. However, the presence we have noted so far is only to increase Iran’s cultural influence in that country,” says one intelligence official. “We have seen no planning or activity that indicates Iranians are trying to get to the homeland via Latin and Central America to conduct operations.” DHS also says there’s no “credible evidence” of any terrorist groups operating along the border. Colombia accused Venezuela of providing sanctuary to some 1,500 communist guerrillas who have set up “summer camps” along the border, where they allegedly rest and feast while planning kidnappings and attacks on Colombia. Soon after, Venezuelan President Hugo Chavez broke diplomatic relations with Colombia. The left-wing Venezuelan leader called the Colombian accusations a US-inspired “aggression” and said he was ordering “a maximum alert” on his country’s border with its Andean neighbor. “We have no other choice but, out of dignity, to totally break our relations with our brother nation of Colombia,” Mr. Chavez said live on state television, as he hosted a visit by Argentine soccer idol Diego Maradona. The diplomat said the four alleged camps in Venezuela are often visited by two top commanders of the Revolutionary Armed Forces of Colombia, or FARC, Latin America’s largest guerrilla army. He presented videos and photos that allegedly showed guerrilla leaders roasting a pig and relaxing at headquarters inside Venezuela. Today Venezuela is hardly the brutal dictatorship that some critics of Chavez paint it to be. Yet the country’s democratic institutions have suffered considerably since the coup. Chavez and his allies have effectively neutralized the judiciary. While some newspapers and broadcasters are still independent and some are outspoken in their opposition to Chavez, the President and his legislative supporters have strengthened the state’s capacity to limit free speech and created powerful incentives for self-censorship. 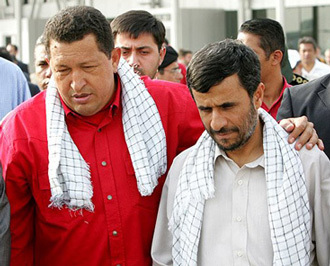 The current presidents of Venezuela and Iran, President Hugo Chavez and President Ahmadinejad, respectively, have both described themselves on the world stage as opposed to US imperialism and they use these accusations also to contain Human Rights and freedom of speech. 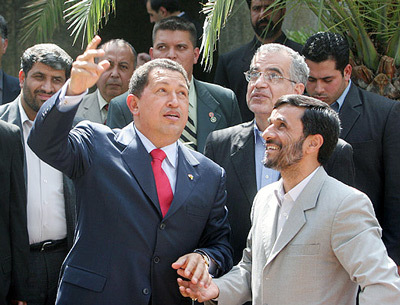 During the 2009 G-20 London summit, Chavez and Ahmadinejad held their own meeting which they called the “G-2” summit, at which the formation of a joint Iranian-Venezuelan development bank was announced, initially with US$200 million capital. Iran has stepped up its military presence in Venezuela as part of a program to export its “revolutionary principles” to America’s enemies, according to a Pentagon report. The report on Iran’s military states that paramilitaries from the Quds Force, a special paramilitary unit attached to Iran’s Islamic Revolutionary Guards Corps, have “an increased presence in Latin America, particularly Venezuela”. President Hugo Chavez of Venezuela has been accused of supporting Marxist terrorists in Colombia. Government opponents have long complained that the Supreme Court — whose members are appointed by the predominantly pro-Chavez National Assembly — has been packed with the president’s allies, giving him nearly unlimited power. Chavez denies holding sway over justices. In a move that has drawn criticism as an attack on judicial independence in Venezuela, President Hugo Chavez has jailed a criminal court judge. Her transgression, critics of Chavez say, was straying too far from what the government wants. Human-rights groups say the independent-minded judge, Maria Lourdes Afiuni, was jailed on trumped-up corruption charges after she allowed the release of a former banker who had once benefited from his ties to the government. Venezuela and Bolivia are supplying Iran with uranium for its nuclear program, according to a secret Israeli government report obtained by The Associated Press. As much as Ahmadinejad and Chavez don’t look like each other but their ways for ruling the Governments and suppressing Human Rights, independence media and Government opponents, are the same. Twitter emphasized their news and information network strategy in November 2009 by changing the question it asks users for status updates from “What are you doing?” to “What’s happening?”. In June 2009, following allegations of fraud in the Iranian presidential election, protesters used Twitter as a rallying tool and as a method of communication with the outside world after the government blocked several other modes of communication. On June 15 Twitter rescheduled a planned 90-minute maintenance outage after a number of Twitter users and the US State Department asked Twitter executives to delay the shutdown because of concerns about the service’s role as a primary communication medium by the protesters in Iran. On April 7, 2009, thousands of young anti-communist protesters stormed the presidency and the parliament building in Chişinău, the capital of Moldova, accusing the government of electoral fraud. Information about these events was disseminated through Twitter using hashtag #pman. This hashtag came from the name of the central square in Chişinău: Piaţa Marii Adunări Naţionale. Twitter was also used to mobilize for the protests. On April 10, 2008, James Buck, a graduate journalism student at University of California, Berkeley, and his translator, Mohammed Maree, were arrested in Egypt for photographing an anti-government protest. On his way to the police station Buck used his mobile phone to send the message “Arrested” to his 48 “followers” on Twitter. Those followers contacted U.C. Berkeley, the U.S. Embassy in Cairo, and a number of press organizations on his behalf. Buck was able to send updates about his condition to his “followers” while being detained. He was released the next day from the Mahalla jail after the college hired a lawyer for him. During the 2008 Mumbai attacks eyewitnesses sent an estimated 80 tweets every 5 seconds. Twitter users on the ground helped compile a list of the dead and injured. In addition, users sent out vital information such as emergency phone numbers and the location of hospitals needing blood donations. CNN called this “the day that social media appeared to come of age” since many different groups made significant use of Twitter to gather news and coordinate responses. A Haitian radio host who used Twitter to inform the world about the earthquake which ravaged his country was among the users of the micro-blogging service honored at a ceremony. “I dedicate this to my country Haiti,” said Carel Pedre after receiving a special “humanitarian” award at the second annual “Shorty Awards” in New York, an event which recognize excellence on Twitter. “May we continue to use Twitter to save lives and change the world,” said Pedre, who “tweets” as @carelpedre. Twitter is used to inform people about the news and events happening around the world. Mostly news agency outlets tweet news but that’s not a law or anything. The partial of users in these categories are also increasing. The Distance College of Shanghai Jiao Tong University, China, used Twitter with native Chinese students as a tool to train communicative and cultural competence. Students had to post a certain number of English tweets and react to the tweets of their fellow students. Twitter was viewed as a supplement to practice in authentic environment different aspects of the target language as it was taught in the classroom. Twitter was used by candidates in the 2008 U.S. presidential campaign throughout the race. Democratic Party nominee Barack Obama used it for publicity. The Nader–Gonzalez campaign updated its ballot access teams in real-time with Twitter and Google Maps. Twitter use increased by 43 percent on the day of the United States’ 2008 election. In May 2009, astronaut Mike Massimino used Twitter to send updates during the Hubble Space Telescope repair mission (STS-125), the first time Twitter was used by an astronaut in space. The STS-125 mission marked another NASA/Twitter first–a post-mission tweetup held July 21, 2009, at NASA headquarters in Washington, D.C., attended by about 200 members of the general public. The crew of STS-125 was on hand for answer questions. At March16, 2010, Twitter has announced technology that it hopes will further embed the service into the fabric of the web. Another success for Twitter. Although Chávez is in consistent opposition to the United States, many politics have argued his deepening relations with Islamic extremists and fanatics are curious. 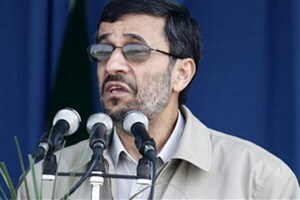 Mahmoud Ahmadinejad stands against America because of its secularism and support of Israel, while Chávez and others in Latin America associate the USA with Capitalism and Westernization, something they as socialists oppose. 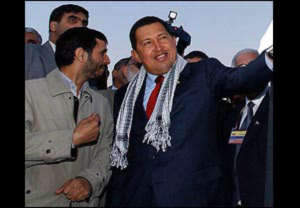 CNSNews says that critics of Israel, many of them in the Arab world, hailed Chávez in his dealings with Israel. Al-Ahram Weekly commented, “It was somehow ironic that Venezuelan President Hugo Chávez, following his attack on Israel and the recalling of his ambassador to Tel Aviv, emerged as the most popular leader within the Arab world”. The Syrian communist party urged Arab governments to “follow the example of Venezuela’s President Hugo Chávez”. 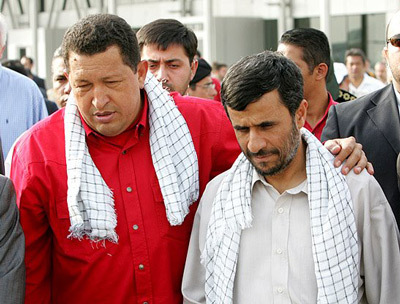 According to CNSNews, the vice-chairman of Hezbollah’s political council, Mahmoud Komati, called Chávez’s actions an example for “revolutionaries”, and a “London, left-wing lawmaker” said that Chávez was a “real leader of the Arab people”. 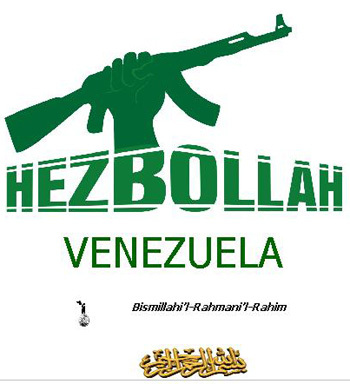 Hezbollah also has ties with Venezuela and “has demonstrated a keen interest in extending its activities to other parts of Latin America.” Hezbollah has also been known to recruit and train eastern Europeans, most notably in Russia, Bosnia, and Slovakia. It has had limited contact with the Provisional Irish Republican Army during the early 1990s. Parliamentary secretary to the Canadian Prime Minister Jason Kenney said that negotiating with Hezbollah would be comparable to negotiating with the Nazi party in the 1930s. According to the Israeli source, Hezbollah operatives in South America are collecting intelligence to this end. The Israeli intelligence community estimates that Hezbollah will try as much as possible not to leave identifying footprints that could associate the organization with the attack in the wake of such a strike in a bid to avoid Israel’s heavy hand. In the same vein, it is estimated that the organization will not take public responsibility for a terrorist attack if it were to carry one out successfully. According to U.S. News & World Report, U.S. government officials say the Chávez administration allows alleged terrorist organizations to operate within Venezuela’s borders, including Hamas, Hezbollah, and Al-Gama’a al-Islamiyya. U.S. officials also allege that the Venezuelan government is knowingly providing identity documents to these organizations. The Venezuelan government denies these allegations. The US Treasury Department indicted two Venezuelan citizens last year for supporting Hezbollah, and froze their assets in the United States. One of them, a diplomat of Lebanese Shiite ancestry, used his position to transfer funds to Hezbollah and to help members of the organization move between Venezuela and Iran for training. The other is a travel agent from the capital city, Caracas, who aided Hezbollah members in planning attacks.